Like the rest of the baseball world, I was saddened by the news of Willie McCovey's passing. 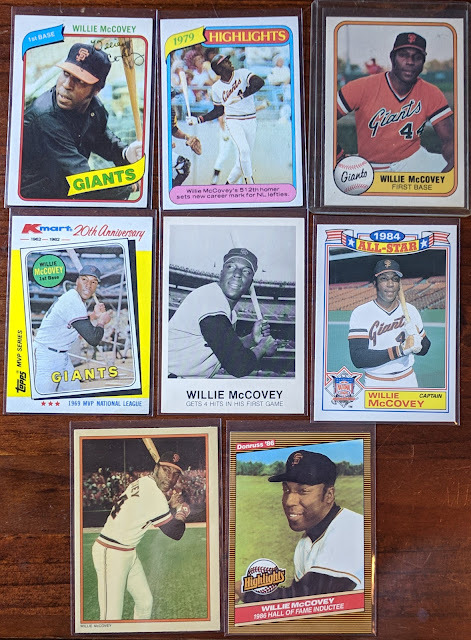 McCovey is one of my favorite players to collect. I'm not sure if you're aware, but the Padres have never been a team that's gotten a lot of respect. So it was a valued source of pride that a big name Hall of Famer suited up for San Diego for a few years, even though he is undoubtedly known as a San Francisco Giant first and foremost. 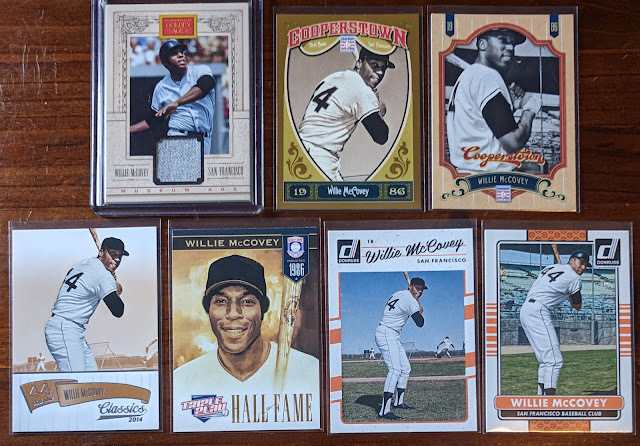 Anyway, I figured I'd pay my respects to the man the best way I know how, by checking out his cards. 60s. Happy to have his rookie and 2nd year cards. Got a couple of those "Friendly Foes" cards, though both have their issues. The '65 Topps up top is from my complete set, not technically stored in the PC. 80s. 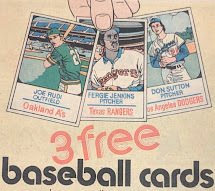 I will be forever indebted to Fleer for being the only company to give him a true sunset card in 1981. 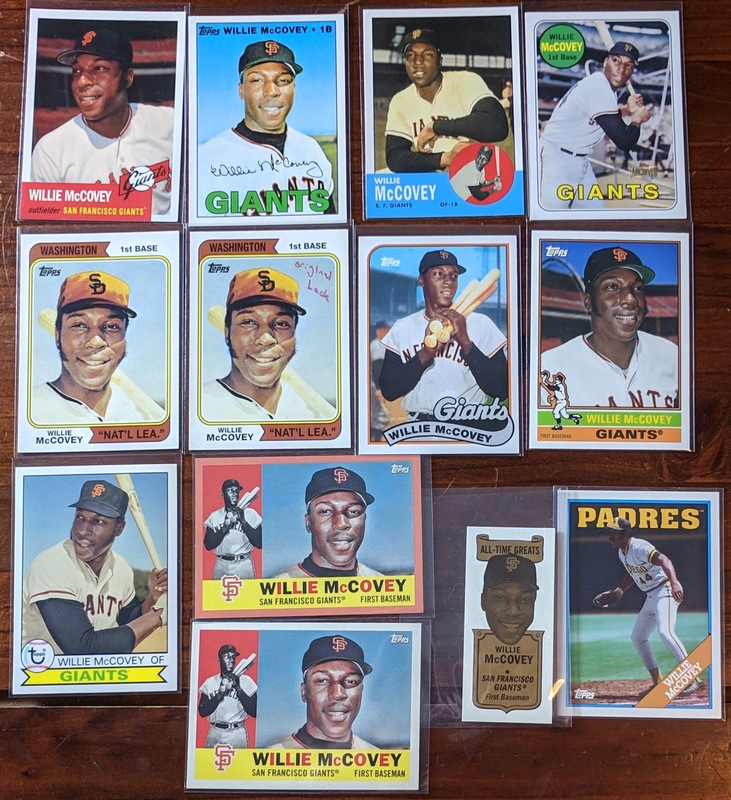 Probably the most I've ever talked about McCovey on this blog is the post I did on that card back in 2013. Not many cards from the 90s, but the three I have are pretty sweet. 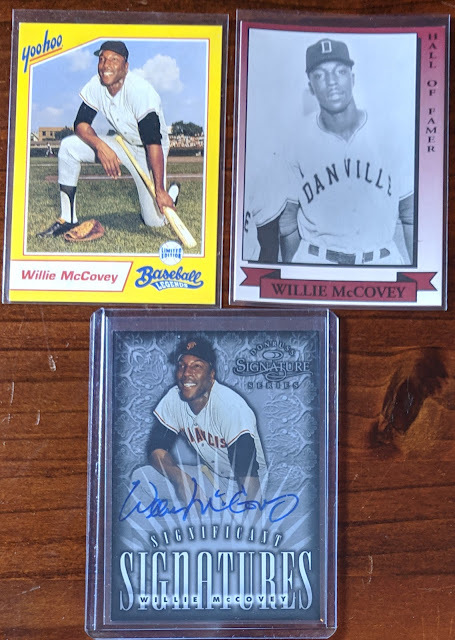 Yoo Hoo, minor league, and an autograph #/2000. 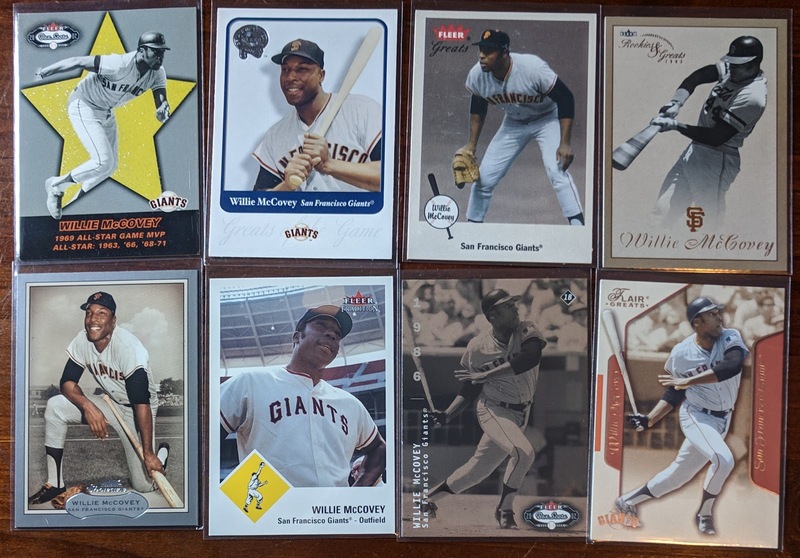 Donruss cards from the 00s. The dual relic card, a surprise from gcrl, is among my favorites. 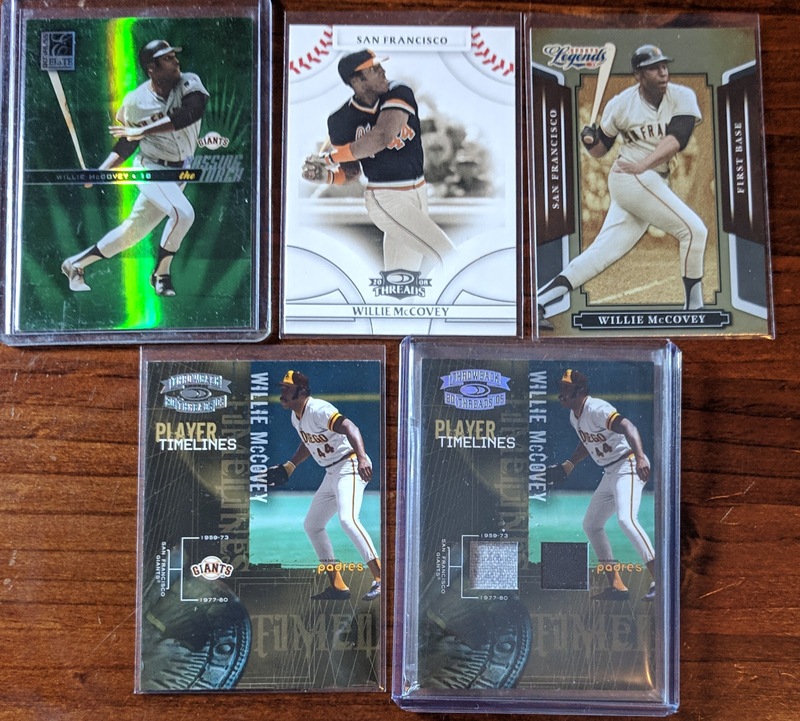 It's a rare Padres hit, plus it's a Christmas Card (#'d 12/25 on the back). 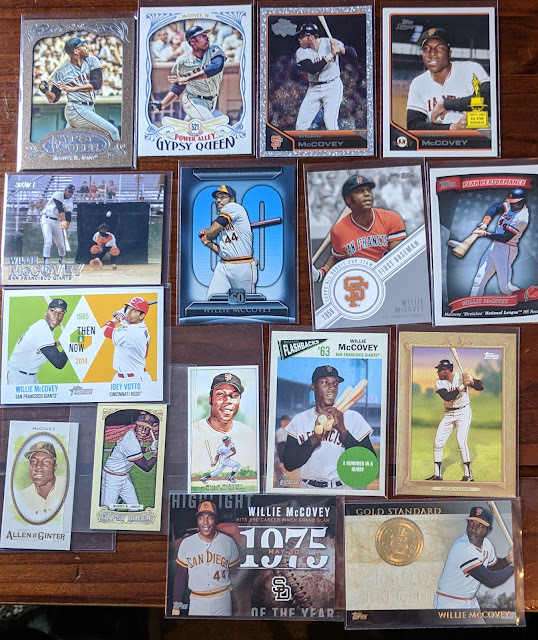 Post-career Fleer cards. 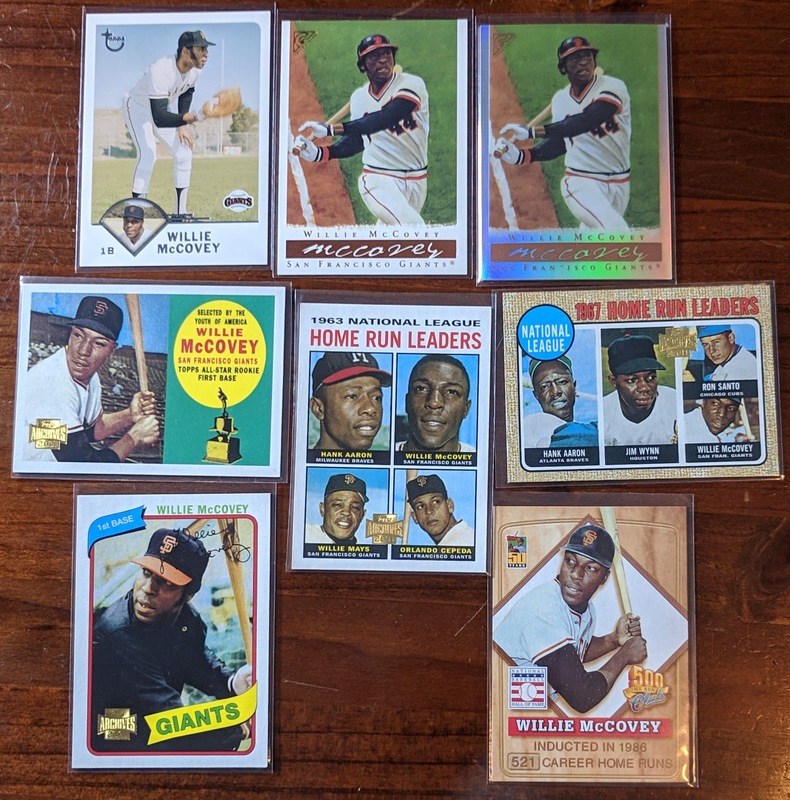 Some great looking cards here. The case is a bit scuffed up, but I love this 2003 Topps Retired auto. Would love to score a refractor parallel someday. Panini, highlighted by a nice Golden Age jersey relic. 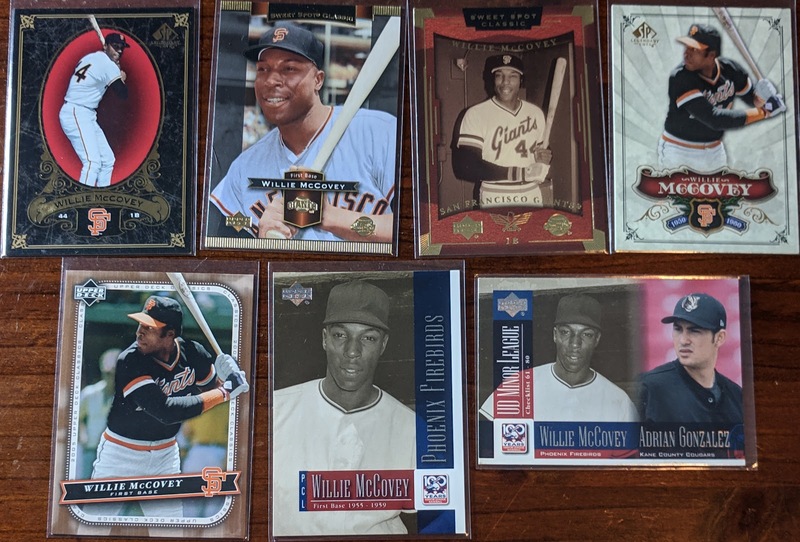 2010s Topps pt 1: a bunch of reprints and pseudo reprints. And lastly, Topps from this decade, pt 2. One card I forgot to include here is one of the better cards in the PC, the SSP glow-in-the-dark parallel of the 2018 Ginter mini (lower left corner is the standard version). Good stuff. He's got a ton of nice looking cards. Photogenic dude, I suppose. 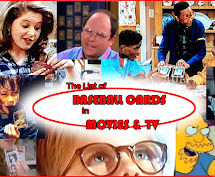 By my rough count, I think that's just over my goal of 100 different cards, so I'll be moving him into the Hundred Card Club section of my wantlist. 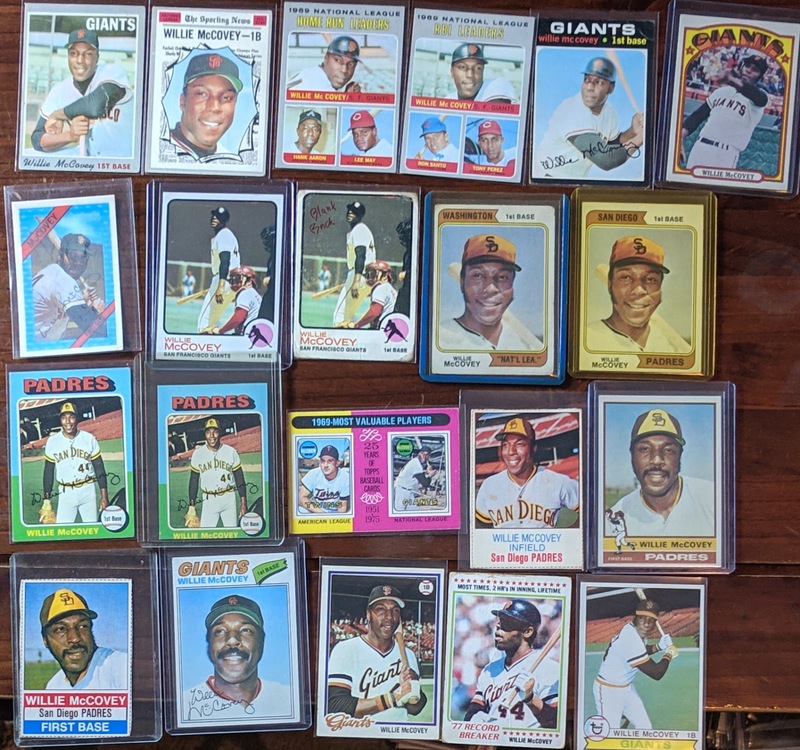 I'd still be interested in trading for cards I'm missing.. especially vintage needs or cards in a San Diego uniform. A great guy by all accounts. Rest in Peace, Stretch. Great cards of a great slugger. 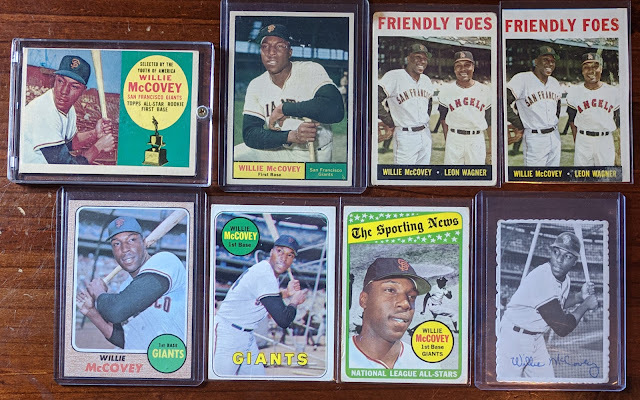 I heard the news late last night and was too tired to watch any retrospectives but I cued up the 9th inning of the '62 WS this morning...man, was he ever close to having a Bill Mazeroski moment. 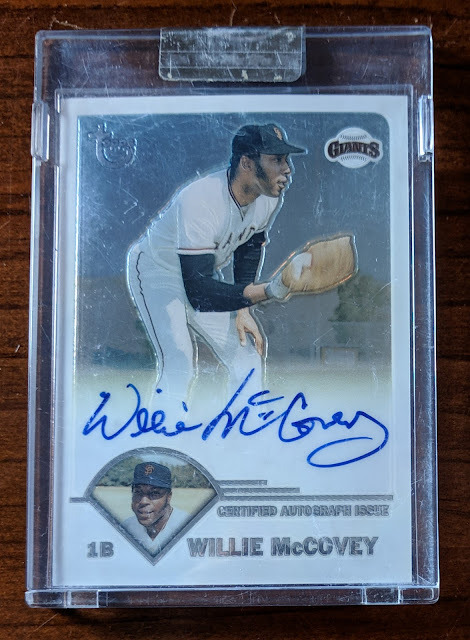 I probably have less than ten McCovey cards in my collection-but I do have a relic from 2007 Sweet Spot classic. And that Highlight of the Year insert is in my pile to send to you. Do you still want it? I didn't know you had it until now. Yeah, free to take it out, but thanks! Nice collection. Kinda makes me want to dig through my collection and see what I have on him. It was really nice hearing people reminisce about Stretch on the local radio today. From all accounts from fans, friends, and his fellow teammates... he was a great human being. He'll be missed, for sure. 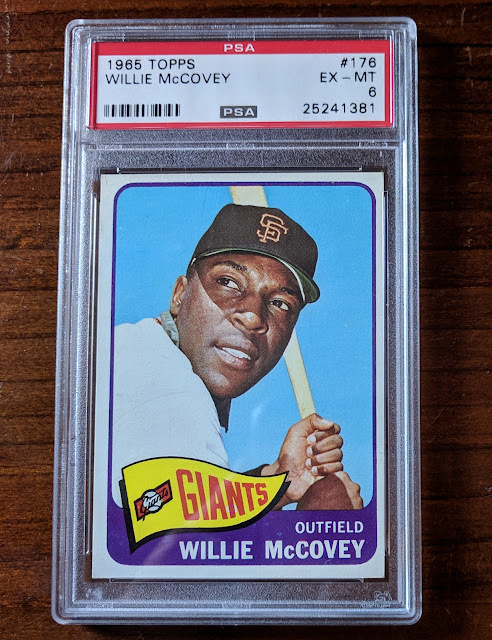 Love the vintage cards in your PC. One that gets overlooked is on my Top 10 Wantlist, the 1960 All Star. It's one of the few if not only times a HOF player received two rookie cards in one set. Yeah, that's a cool card.. I'll have to track one down someday. I've got an extra copy of the base version of the sparkly Topps Lineage card in the last picture. If you want it I'll save it for our next trade. Sure, I could go for that card. Thanks!